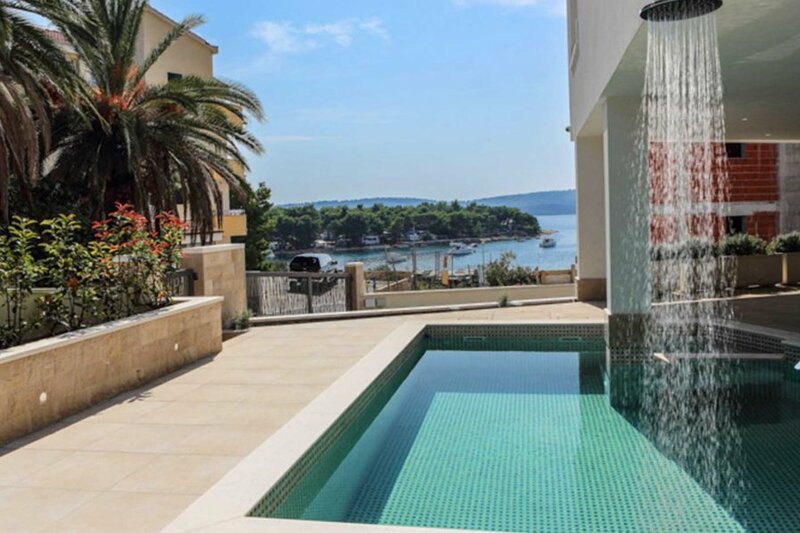 Luxurious five star villa Viola with pool and sea view is located close to a pebble beach on the island of Čiovo. This elegant and modern house can accommodate 14 people, which makes it ideal for large families and bigger groups. This architectural gem, built in 2016., has a generously and elegantly designed living area which offers its guests comfort and luxury. The property spreads on 650 m2, while the house is divided on the basement, ground floor, first and second floor. The basement of villa Viola is designed as a recreation area with gym, sauna and an indoor Jacuzzi. The ground floor consists of an elegant and luxurious living room with large dining table for 10 persons and a fully equipped kitchen. The first and second floor are designed as a resting area with 7 double bedrooms with en suite bathrooms. Spacious terraces and balconies with outdoor tables and chairs, sun loungers and a breathtaking sea view complete the feeling of being in a small paradise. Villa Viola has fully centralized air condition and Wi-Fi internet connection, while all bedrooms are equipped with LCD satellite TV. The ground floor has access to a spacious terrace surrounding the pool (30 m2 with lights) with garden furniture, sun lounger and barbecue with large dining table. The property offers total of 6 parking spots for the guests in front of the house and in the garage. A buoy for boats is available at request.